We planted our tomatoes three weeks ago and so far they are doing very well. The plants all took readily after transplanting and they’ve grown like crazy; in fact half of them are already at the top of their cages. We set 19 tomato plants and 4 tomatillo plants, then had to add more tomatillos when one of them keeled over. The purple tomatillos are in this bed in the back left corner, and the green tomatillos are outside the frame on the far right of the bed. We have learned that the tomatillo plants need plenty of space, so their cages are a little larger around and substantially taller because they’ve always grown at least 9 feet tall, and we usually end up tying them to the top of the deck rails about 5 feet above their cages. We also planted some marigolds among the tomatoes and peppers, then seeded Genovese basil along the front of the tomato bed between the marigolds, and it’s starting to sprout. Basil and tomatoes are good companion plants for each other, and the marigolds act as both a trap and a deterrent for certain pests. This year we have a couple of tomato plants in containers on the deck, and we specifically chose a variety that does well in containers, the Husky Cherry. The plants don’t get very tall and they are good producers, in fact both have some little green fruits now. Monkey Boy has already shown interest in these little green tomatoes, his favorite color, so we’ll have to see how many go missing before they ripen. 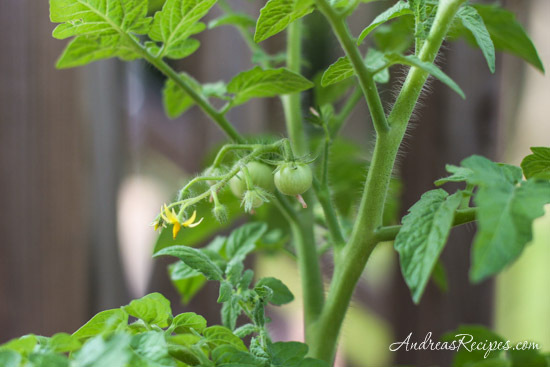 Your tomatoes are looking great! Are those Green Zebras in the last photo? That’s probably my favorite tomato these days. Thanks Kalyn. Those are little cherry tomatoes we have in containers on the deck. We don’t have Green Zebras this year, but we do have Michael’s favorite, Mr. Stripey. Wow, so envious of all your tomatoes! Here in Kuching, it rains too much to grow tomatoes – they get all mildewy and mushy. 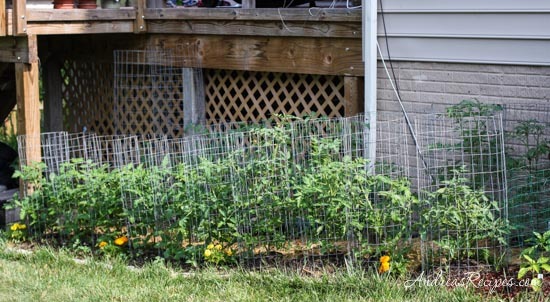 I think you’re going to have to either stake the tomatoes or just let them overrun your cages. I understand that stacking cages works. The gardens are just starting to bloom here in Stuttgart. This is one of the greenest cities I’ve ever seen. Seems like evryone has a garden here! Our tomatoes are looking good this year too. Happy gardening. 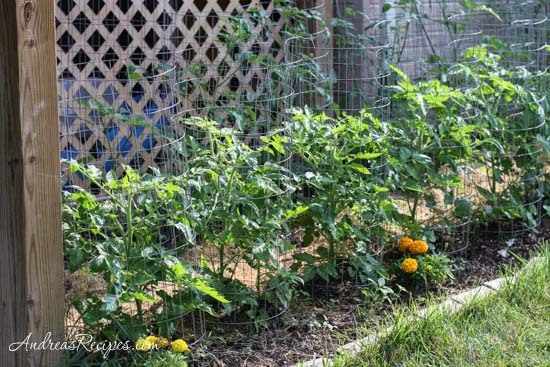 thanks for your blog, I know now how to plant tomato properly.